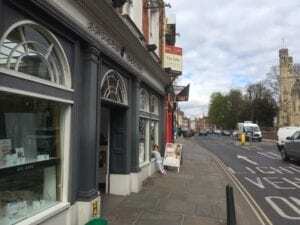 Andrew & Rogers Optometrists is an independent opticians located in in the heart of Beverley, specialising in contact lenses, independent label, designer, and luxury eyewear. Founded over 20 years ago by experienced optometrists Andrew Scott and Roger Smyth, Andrew & Rogers uses leading technology and cutting-edge innovation in elegant and modern surroundings to provide expert eyecare. The first thing to say was that they have parking and it’s very easy to find from the sat nav postcode! The opticians is on North Bar, close to Saturday market, and there are parking spaces located just behind. Eye tests are free for all children under the age of 16 and for those ages 16, 17, and 18 who are in full time education, there is no limit on how many eye tests your child can have. You can have your child’s eyes tested at any age if you have any concerns about their vision or their eye health. However, the usual age for a first sight test is 2. In addition to the free sight test, children receive a voucher towards glasses which depends upon the prescription – the higher the prescription the higher the value of the voucher. When we arrived the staff were very welcoming and my daughter loved looking at the glasses while I sorted out the paperwork. It’s a lovely environment with comfy sofa’s and a huge range of glasses to choose from (if you need them). We went through to the examination room and the optician Andrew was very friendly and put my daughter at ease. He showed her some of the equipment he would be using and explained what things did. She can sometimes be quite shy and nervous but she happily sat in the chair and let him start by looking at her eyes. She sat on my knee for some of it and on her own too. I’d asked in advance how to prepare her for the experience and they’d said to not emphasise that its a “test” as this could cause anxiety, so we had simply talked about it as a trip to the opticians to have a look at how her eyes worked and if she needed glasses like some of her friends at school have. She them looked at the screen of letters to see which she recognised (she doesn’t know them all yet as she’s only in foundation but that didn’t impair the test). The check was very thorough and he used lots of tests to check all aspects of her vision. Her vision was absolutely fine, to her horror as she had wanted to get some glasses just like her friend at school! So she has got to make do with some new sunglasses when the weather warms up instead! Andrew was very knowledgeable; I wear glasses/contact lenses and he explained about how it can be hereditary but how new technology is coming along to help prevent children’s eye’s worsening. He advised me how often to get my children’s eyes tested bearing in mind my short-sighthedness and gave me advice too, it wasn’t rushed at all and I found it a really interesting morning! 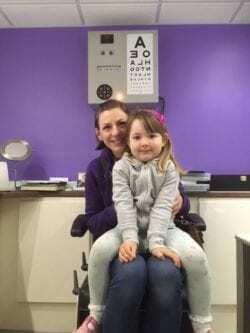 How often your child has an eye test is dependant on their prescription but the general rule is at about once a year – but again this can be more or less depending on the individual. children may not realise themselves that they have vision problems so not having an eye sight test can mean that they go undiagnosed for years. Andrew & Rogers offer specialised services such as the Colorimeter test too, also known as a visual stress test. This unique technology allows them to measure the exact coloured tint required to minimise visual stress symptoms, a common problem amongst both children and adults. Colorimeter tests are used when a child or adult experiences visual stress (headaches and migraines when reading, eyestrain, words and letters jumping around the page, tiredness when reading). Signs in children will include rubbing eyes, moving closer or further away from the page, becoming restless when reading, skipping words or lines, excessive blinking. The outcome is usually the patient being prescribed precision tinted lenses, or overlays/reading rulers. It has also been found to help children with dyslexia to improve their reading. You can find out more about what happens in the test on their website here. I’ve been to lots of opticians during my life, mostly chains, but with an independent optician they can spend more time with patients and be flexible to suit their needs. 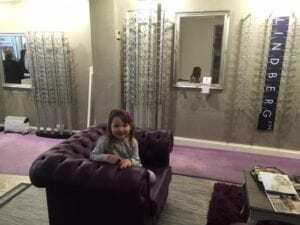 I am a convert and will now be using an independent optician for myself and for my children! I’ve already booked another appointment to take my son to Andrew and Rogers for an eye test. To find out more or book an appointment, visit their website here, call 01482 860362, or simply pop into the store if you want to browse their wide range of eyewear brands.